In this defect, the outflow tract leading from the heart into the aorta, which carries oxygen-rich blood to the body, is obstructed. The most common type of Aortic Stenosis, known as valve stenosis, involves a narrowing of the aortic valve (indicated by the arrow in diagram). This may be caused by the aortic valve leaflets being fused together, small or too thick, causing the valve to not open properly. 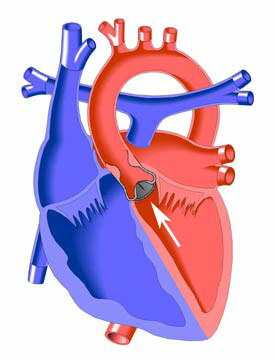 A common form is bicuspid aortic valve where the valve has two leaflets instead of the normal three. Occasionally, the obstruction does not involve the aortic valve itself but consists of narrowing of the passage either above (supravalvular) or below it (subvalvular). Supravalvular aortic stenosis commonly occurs in patients with Williams Syndrome. Subvalvular stenosis can be associated with other congenital heart defects such as a ventricular septal defect or mitral stenosis.